As a one-stop spot for native and exotic plants, Universiti Putra Malaysia (UPM) Conservatory Park features a collection of nearly 500 species of such plants. The park sprawling on an area of almost one hectare, is the focal point for research, learning, reference as well as recreation. Complete with a nursery, it draws visitors who want to get the plants or herbs for the purpose of traditional treatment. Formerly a rubber plantation, it was managed by Unit Ladang Universiti in the early 1980s before it was handed over to Bioscience Institute (IBS) in 1996 for the purpose of research activity. IBS Agriculture Officer, Rishzuan Talib said the park is divided into 11 zones based on its functions, usage and species of plants. The zones are Ginger, Medicinal Plants, Ferns, Traditional Vegetables, Aquatic Plants, Wild Orchids, Pitcher Plants, Aroid, Spices, Aromatic Plants and Forest Fruits. The focus, however, is mainly on herbal plants. At the Medicinal Plants zone, there are about 200 species of native and exotic plants that could be found in the country such as Mata Pelanduk (Ardisiacrenata) and Lemba (Molineriacapitulata). Rishzuan said iconic plants at the park were Keladi Murai or Belimbing Tanah (Taccaintergrifolia), known for their medicinal value said to be able to treat diabetes and high blood pressure. Other medicinal plants available at the park include Tongkat Ali (Eurycomalongifolia), Kacip Fatimah (Labisiapumila), Tongkat Ali Hitam (Polyathiabullata King), Tunjuk Langit (Helminthostachyszeylanica), Pecah Kaca or PecahBeling (Strobilanthescrispa), Putat (Baringtoniaracemosa ), Mahkota Dewa (Phaleriamacrocarpa), Senduduk Putih (Melastomadecemfidum), Belalai Gajah (Clinacanthus Nutans) and HempeduBumi (Andrographispaniculata). 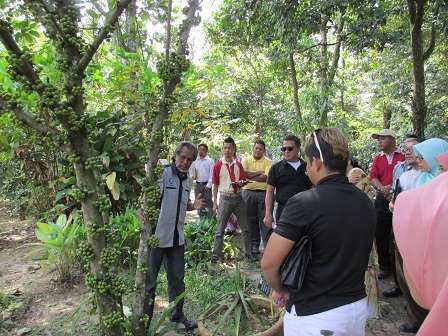 He said most of the species available at Medicinal Plants Zone were those obtained from forests in Peninsula Malaysia. He also said the species possessed medicinal benefits as an alternative to modern medicines. There were those that were rare and very difficult to find. At Ginger zone, there are about 100 species which make up half of the total number of species that could be found in Malaysia, including Tepus (Zingiberspectabile) and Kantan Hutan (Etlingeraterengganuensis). There are about 50 species of traditional vegetables at the Traditional Vegetables zone, such as Daun Gajus (Anacardiumoccidantale) and Daud Salam (Syzgiumpolyanthum), obtained from jungles and vegetable farms. Over at the Aromatic Plants Zone, there are about 50 native and exotic species. The fragrance from these plants is spread through various important components such as the flowers, leaves, barks, fruits, saps and roots like those of Cempaka (Micheliachampaca) and Hidung Babi (Rothmaniamacrophylla). Rishzuan added that the Conservatory Park was part of Edu-Park UPM's programmes where three modules were introduced for visitors – Explore The Park, Herbal Spa and Take Me Home which can be obtained at a minimal rate. Under Explore The Park module, visitors will be taken through a special passage around the park by guides who will be briefing them about the plants available. Each tree is tagged with its scientific name, local name as well as a description of its usage. The trees are marked with an ID and the information is kept in a database which could be obtained by surfing its website. There is a free wi-fi here. Visitors have the choice to follow the Herbal Spa module where a demonstration on the use of herbal plants for bathing is conducted. It is not only invigorating but helps to stimulate blood circulation and is ideal for those who have just given birth. He added that seven types of leaves that could be used for bathing including limau kasturi, pokok lemuni, serai wangi, lengkuas and daun kantan were normally cut into pieces first before they were boiled in an earthen pot. The leaves will give such a refreshing aroma. The product are sold in the form of sachet at RM30 for each box which contain five sachets. Each sachet can be used twice. Meanwhile, under the Take Me Home module, children will be entertained to a floral drawing activity while the adults are given a demonstration on planting and growing of herbs.